The Honors Program allows International Studies majors to engage in research leading to the completion of an honors thesis. The topic for the honors thesis is selected by the student, in consultation with a faculty advisor, and should reflect a theme consistent with the student's module in the International Studies major. The Honors Program is open to all junior and senior International Studies majors with an overall GPA of 3.0 and a 3.5 GPA in the major. Successful completion of a written senior thesis in the International Studies 190 course satisfies the upper-division writing breadth requirement. The Undergraduate Research Opportunities Program (UROP) in the Division of Undergraduate Education encourages and facilitates research and creative activities by undergraduates from all schools and academic disciplines at UCI. Research opportunities are available not only from every discipline, interdisciplinary program, and school, but also from many outside agencies, including national laboratories, industrial partners, and other universities. 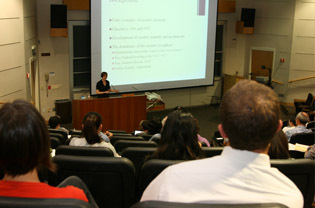 UROP offers assistance to students and faculty through all phases of the research process, whether it is with proposal writing, developing research plans through project management skills, awarding grants to fund research projects, scholarly journal writing through The UCI Undergraduate Research Journal, or presenting results of the research or creative project through the UCI Undergraduate Research Symposium. This experience provides students with the necessary skills to succeed in their future careers. Conducting research and creative activities should be an integral component of the education undergraduates receive at UCI, regardless of their career choice. The Summer Undergraduate Research Program (SURP) provides funding for UCI undergraduates from all disciplines who are conducting summer research projects or creative activities under the guidance of UCI faculty members. The program offers students the opportunity to become immersed in a research topic for a full-time ten-week period, or the equivalent of 400 hours. Independent study research possibilities are available with faculty advisor.